At the beginning of this month, the PEW Research forum released a very detailed survey about the American Jewish community. The reason why PEW did this survey, is because in 2000, the United Jewish Federations of America decided they did not want to do one themselves. I do not know the reason why they did not want to do the survey, but that is irrelevant. What is interesting is many of the findings. 1. If Judaism was a business, it would be a failure. 55% of those born to Reform parents remain Reform. Of the current Jewish population in America, 10% are Orthodox, 18% are Conservative, and 35% are Reform. 2% of the Jewish people are converts. 80% of Jews say that being Jewish is important to them. 96% of Jews are either Orthodox, Conservative, Reform, Just Jewish, or Other. I can only conclude one thing. The Jewish people need to know and understand an alternative to the Judaism they have known about for the past 200 years. 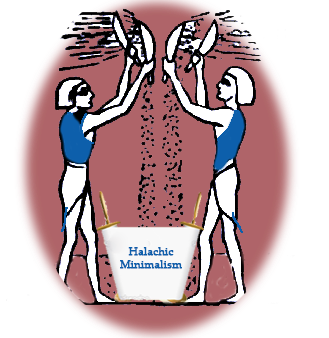 We need to go back to our roots, to what I call in this blog, Halachic Minamlism. Follow up: Here are my rough estimates, based on some old data, about the population numbers of various groups of Jews in both the US and Israel. I find the numbers sobering. *Atheist/Agnostic is counted as a subset of Secular.